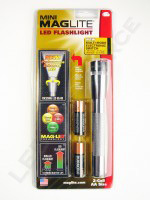 Most of us probably have a Maglite of some sort sitting around the house. 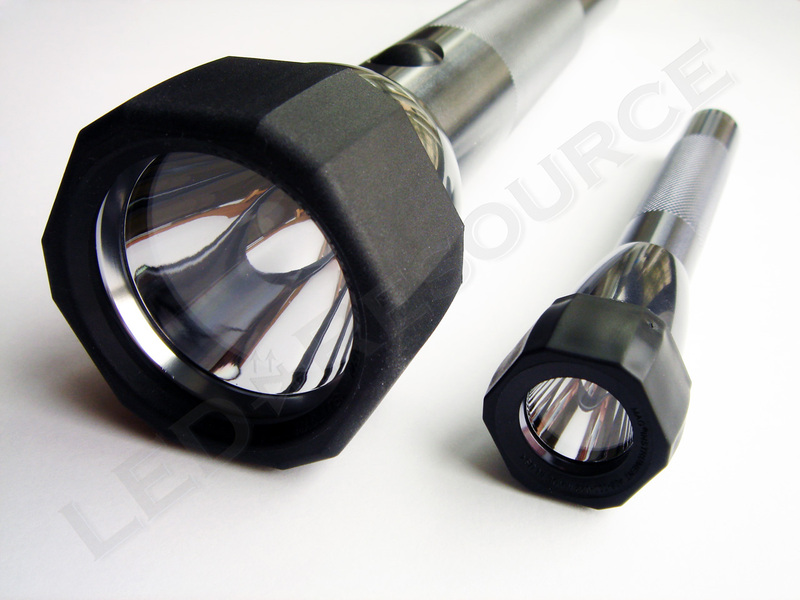 Known for their superior build quality and durability, Maglite is considered to be the everyday premium flashlight. 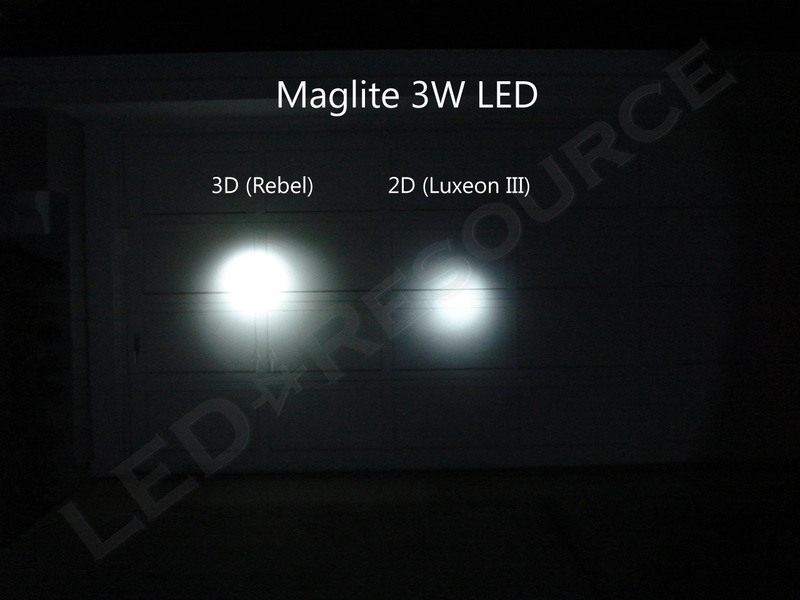 We will be taking a look at Maglite’s LED line of flashlights featuring the latest Luxeon Rebel LED. 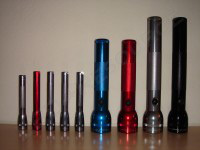 The LED Maglite is available in several form factors and with two kinds of LEDs, and the type of LED is something that should be given some thought as there is a significant difference. Older lights are frequently still seen on the shelf, so the kind of LED should be noted. 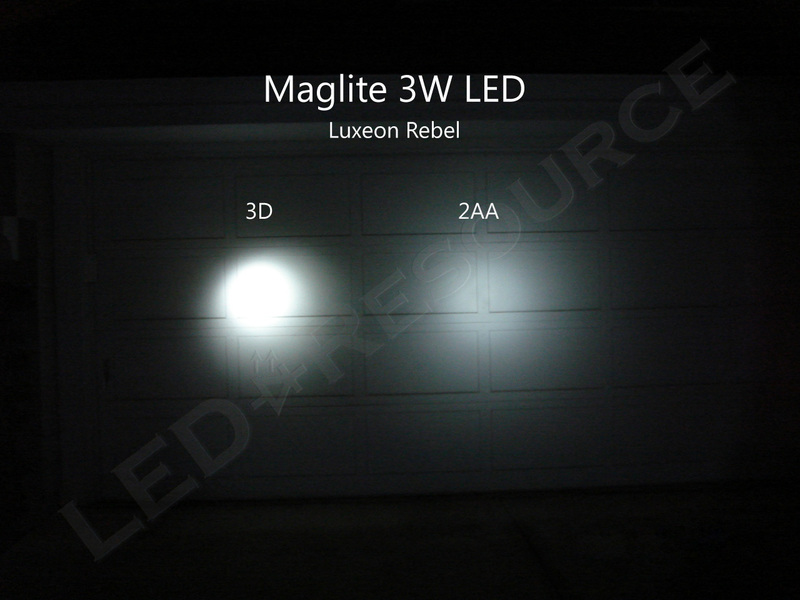 The current LED Maglites use the Cree XP-E LED, and previous generation LED Maglites use the Philips Lumileds Luxeon Rebel or Luxeon III LED. 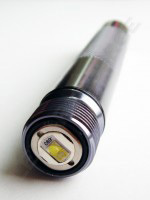 The Cree XP-E is brighter and more energy efficient than both Luxeon LEDs, however, older models are often mixed with new stock on retail shelves. The Luxeon III (left) is larger than the Luxeon Rebel (right). 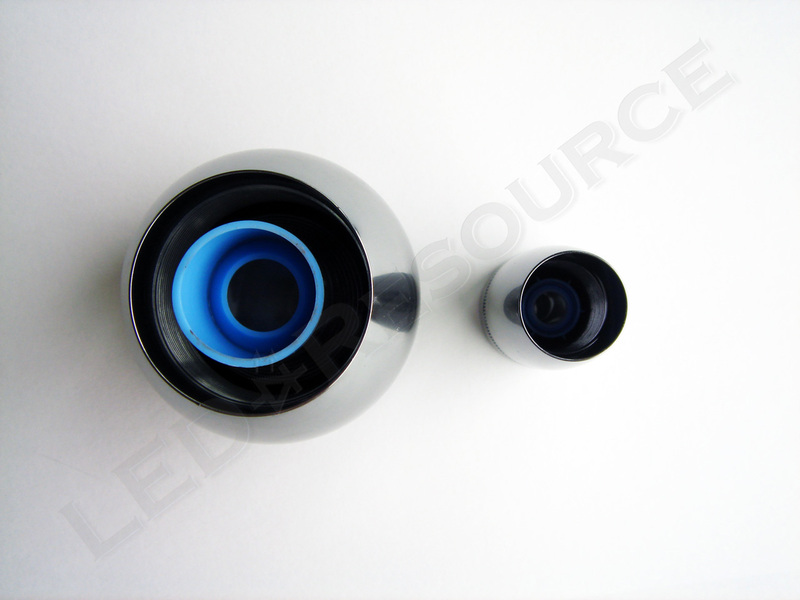 The Cree XP-E is mounted similar to the Luxeon Rebel, and the main difference is the square base of the XP-E. The only way to differentiate between the models is to look down the business end of the light through the clear plastic packaging. With the D-cell lights, the serial number also indicates the type of LED inside. If the serial number begins with DLXXXXXXXXX, it is either Cree XP-E or Luxeon Rebel. If the serial number begins with DXXXXXXXXXX, it is the Luxeon III. Also, if the packaging mentions interchangeability with incandescent bulbs, then it is the Luxeon III. 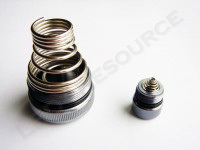 The 2AA light is an exception and is actually available in three different form factors. 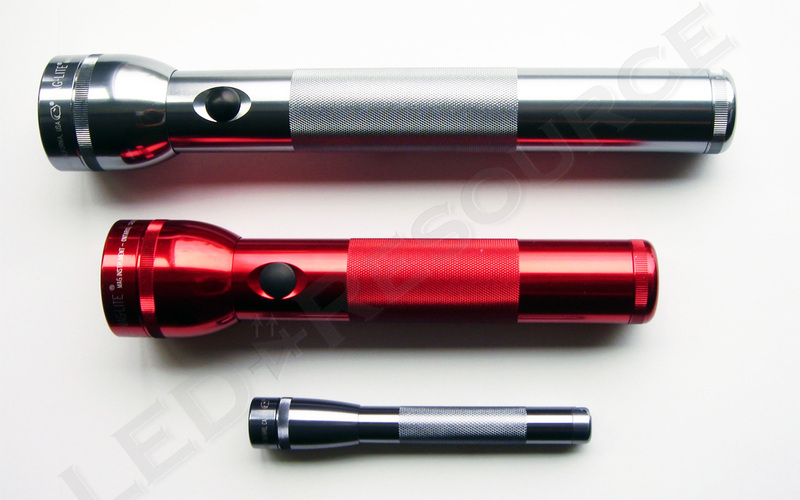 There are two types of the 2AA with the Luxeon Rebel – one with the flat tail cap (old), and one with the lanyard tail cap (current), similar to the regular 2AA Mini Maglite. 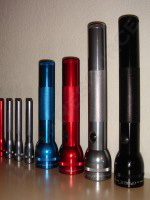 The lanyard tail cap is preferable to the flat tail cap due to increased reliability, as well as compatibility with regular Mini Maglite tail caps (making aftermarket accessories such as “clickie” switches usable). A common question is 2D or 3D? The gist of that decision is personal preference. The 3D is a hefty light, but it has, by far, the longest runtime. The 2D is more compact, but runtime is shorter due to the need for voltage boost. The difference in brightness between the two is not very significant, so considerations should fall on runtime and size. 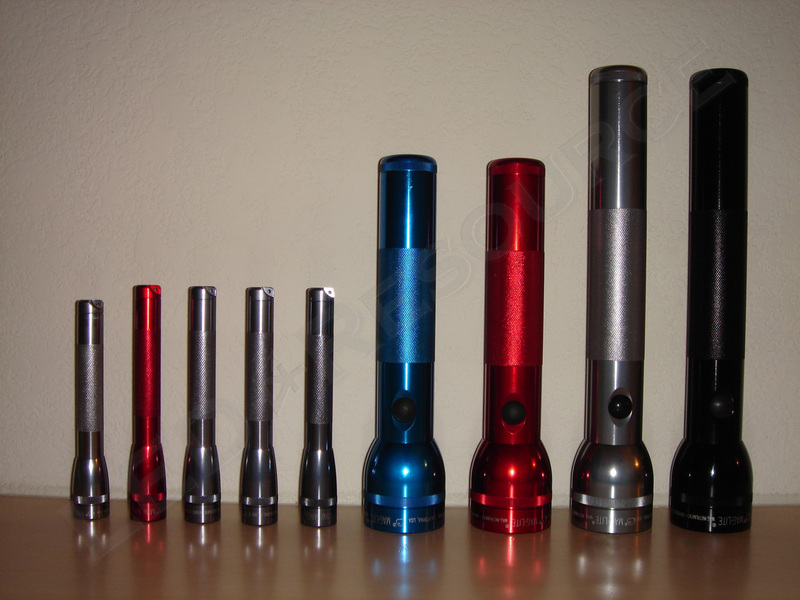 Compared to other premium flashlights, Maglites have one major advantage – local availability. At the time of writing, regular price for the 2AA is usually around $20. Frys and Lowe’s also sell the lights online, but after reading the previous section, you will know that ordering online is not a good idea. I was able to pick up several 2AA lights for about $10 each, at Lowe’s and Home Depot during the year-end holiday sale. The 2D and 3D models are a little more expensive, at around $30 for either. If you are a Costco member or know someone who is, Costco has a 2AA and 3D twin-pack that is a great deal for $29.99. Again, prices vary by time and location, so this should only be interpreted as an estimate. 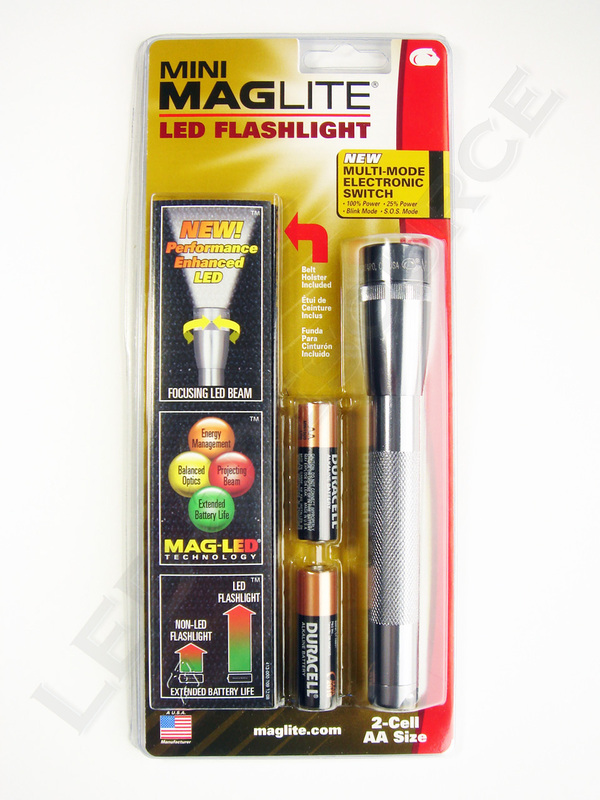 For the 2AA, included in the blister packaging are: Maglite LED 2AA flashlight, 2 x AA battery, and belt holster. For the D-cell models, only the light is included. 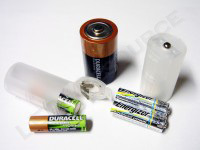 While the 2AA includes two alkaline batteries and the instructions specify that only alkaline batteries should be used, it is not recommended to use alkaline batteries. The reasoning behind this is that no matter the brand, alkaline batteries can and will leak! If the light is stored in extreme conditions, such as in the glove box of a car, the chances of leakage are much higher. Instead, lithium primaries or low self-discharge (LSD) NiMH rechargeable batteries are better alternatives. 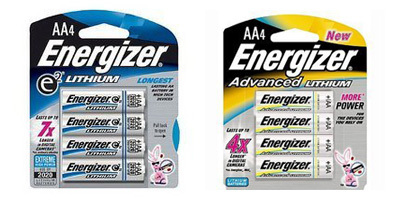 Lithium primary batteries, such as Energizer Advanced or Ultimate Lithium, are more expensive, but last longer than alkaline, perform better in cold temperatures, do not leak, and are approximately 1/3 lighter than the average alkaline. The voltages of these batteries are also slightly higher, which leads to increased output compared to alkaline. LSD NiMH rechargeables, such as the Sanyo Eneloop that popularized low self-discharge, are able to retain charge up to one year. 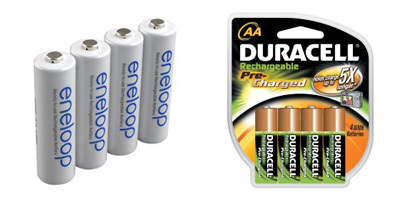 One thing to note about LSD rechargeables is that Duracell Pre-Charged rechargeable batteries that have a white top on the positive end are re-packaged Eneloops, and these are preferred over the black top counterparts. If you’ve ever used rechargeable batteries, you’re probably aware of the extremely high self-discharge rate that could leave the battery half-empty in a short amount of time. LSD rechargeables are an investment that will definitely pay itself off if the light is used frequently. For D-cell lights, options are more limited, and quality alkaline batteries are a good choice. Rechargeable LSD NiMH D-cells are quiet expensive and difficult to find, though AA to D adapters can be purchased online so that primary or LSD AA’s may be used. Some adapters offer the ability to hold 2 AA’s in parallel, which will greatly increase runtime. In addition, 2 AA’s will be lighter than a D-cell. The head features a plastic lens and a smooth reflector. The beam can be focused with a quick turn of the head, and the D-cell models feature continuous cam action so which direction the head is turned will not matter. The 2AA light sports a multi-mode switch with four modes: 100%, 25%, blink, and SOS. If the light is needed for an extended period of time, one set of batteries will last for more than a day on 25% mode. The D-cell lights feature a three position on/off switch: momentary, on, and off. D-cell lights with the Luxeon III will have a spare incandescent bulb in the tail cap. For the Luxeon Rebel models, the tail cap is not very interesting and consists of only a spring. 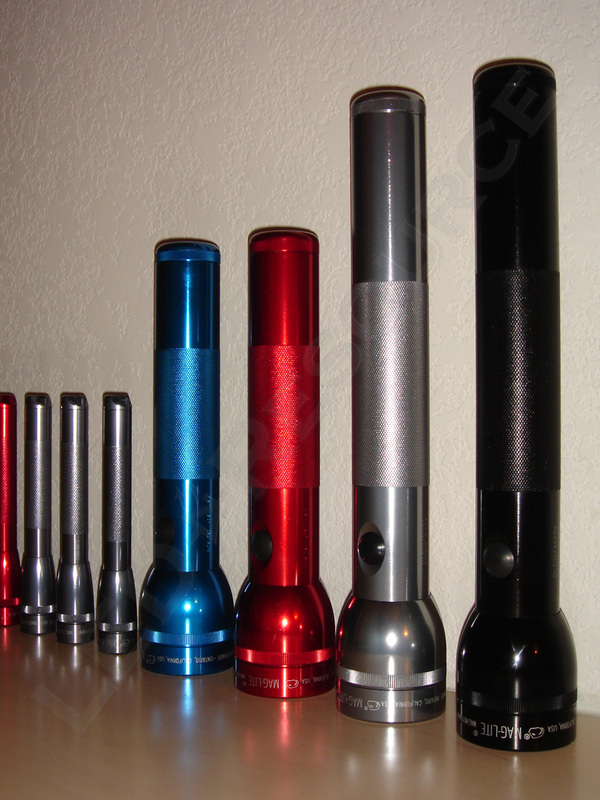 Below are ANSI technical specifications for most of the Maglite product line. 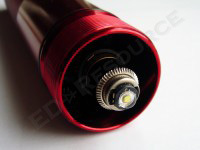 All of the LED Maglites are regulated, which means that as the batteries are depleted and voltage drops, more current is drawn from the batteries to offset the lower voltage, resulting in consistent brightness until the batteries are completely depleted. 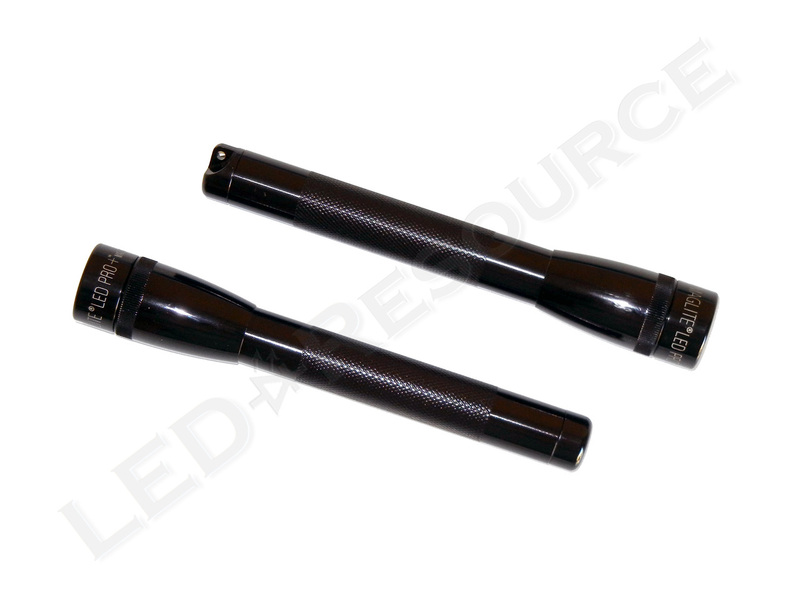 Maglite offers a decent variety of OEM accessories for their lights, ranging from belt holders to lamps to traffic wands. I purchased a D-cell and an AA accessory pack, which came with a rubber anti-roll ring that also protects the head and lens from scratches when set down head-first, as well as a set of red, blue, and clear lenses. The D-cell accessory pack also came with a pair of mounting brackets, which I found to be convenient for storing the light. The mounting brackets are quite firm and the light snaps in with a solid THUNK. 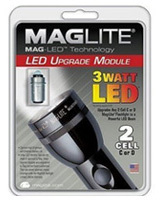 For those with incandescent Maglites, Maglite offers a 3W drop-in LED upgrade for the 2-cell, 3-cell, and 4-cell C or D lights, which uses the Luxeon III LED. This upgrade is being discontinued due to the older LED used, but there are aftermarket upgrades (including some with the Luxeon Rebel LED) available from manufacturers such as TerraLUX. For Mini Maglites, there are no OEM upgrades, but TerraLUX and Nite-Ize make 1W LED upgrades that will certainly improve the light’s usefulness. These lights are certainly quite handy to have around! The size of the 2AA makes a great every-day carry (EDC) light, or could be handy to keep in glove boxes or emergency kits (with lithium batteries installed, of course). Whether you’re an avid outdoorsman or just wandering around the house late at night trying to find your bedroom, these lights are great value and will come in handy, ready for action, for years to come. 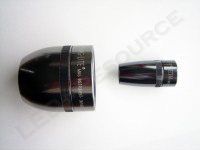 Try cleaning the edge of the tailcap. If it’s not making proper contact, it could cause intermittent problems. Is there a quality difference between the blister pack vs presentation box? I have three XL models, but only one can in a presentation box, its seems to be flawless whereas the other two, silver and blue, seem to have many dents in the body. A shame. There should be no difference in the lights. How large are the dents? It’s possible that they may have been damaged through the packaging, as the blister pack is soft. I’ve just bought a 3D LED Maglite – 168 lumen/79 hours, bearing the chip number 017. It doesn’t seem as bright as my old 3D – 131 lumen/79 hours – the XP-E chip I believe. Can you tell me what chip/emitter is the 017 and why does it not appear to be as bright? Really enjoy your site. Thanks for your great reviews. Most of the newer models have wider beam patterns, which means that the center hotspot is less intense. While the light has a higher output (lumens), that output is less concentrated so it has less intensity (candela) and appears less “bright”. First, thank you for an intelligent, organized, thorough, no nonsense, extremely informative review. I can’t thank you enough for all the work you’ve done for this review. Second, I know exactly what I want to do now without wasting time figuring it out sifting through useless bloviated blogs and reviews. For future reviews, I’ll first look for your relative input if available. First, Thanks for putting together a great review! I found it very informative. I have a 3D cell with the Lexeon III LED upgrade bulb. I’m pretty sure it’s a 3watt but I’m not sure if there are other wattages…no matter. I’m sitting here the dark during a power outage & using it to light the room & I got to wondering about the runtime. While looking over your runtime charts I noticed you didn’t have information for the Lexeon III’s. My question, is that because the comparative runtime between the Lexeon III & other L.E.D.s difference negligible or is that data not available for the Lexeon III specifically? On high with alkaline batteries, the 2-cell light has a rated runtime of 13 hours and the 3-cell has a rated runtime of 37 hours. By comparing the runtime graphs, you can see that after about 7.5 hours, the 3-cell light has just 33% initial output and after 12 hours, it’s already less than 20% initial output. This is still above 10% initial output, so it’s considered part of the FL1 standard runtime. Does the 3-cell light have a longer runtime than the 2-cell? Certainly. How much of this longer runtime is actually useful? Depends on how you plan to use the light. If you are expecting a consistent amount of output, then this is not very useful. If you want to get through an extended power outage or leave something on overnight for a camping trip, then this would work well. 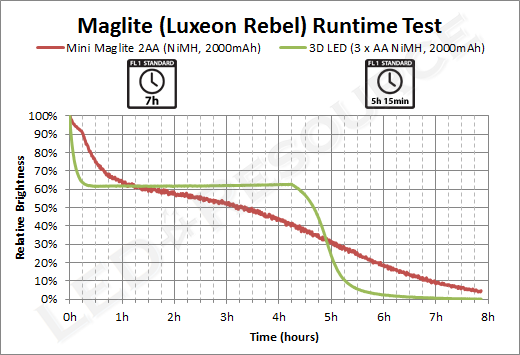 Do you see how we ended the runtime test after 29 hours for the 3-cell ML300LX on high with alkaline batteries? Since the output was already below 10%, it no longer matters for the FL1 standard runtime. However, the light would have likely stayed on at this 5% output for a very long time and I didn’t want to wait until it got to 0%. Getting a little bit more technical here, there is another reason why 3-cell lights tend to have longer runtimes than 2-cell lights. To be accurate, 3-cell lights tend to have a “longer tail” at the end of the runtime graphs. This is because the battery voltage of these lights is closer to what the LED needs, so the circuitry inside doesn’t have to do much work. Even if the batteries are almost completely discharged, there is still enough voltage to keep the LED on at reduced brightness. 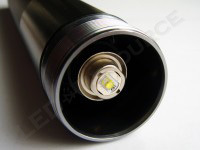 The battery voltage of 2-cell lights is always lower than what the LED needs, so the circuitry inside has to “boost” the voltage up to keep the LED on, which puts more load on the batteries and there is a point where the batteries can no longer support this, so the light just turns off. Hopefully this answers your question with a bit more detail that what you were hoping to get, but now you know! It appears that there is step-down regulation, which causes the output to fluctuate as it gradually decreases. It’s not direct drive either, as then the runtime curve should be smooth and without this jitter.